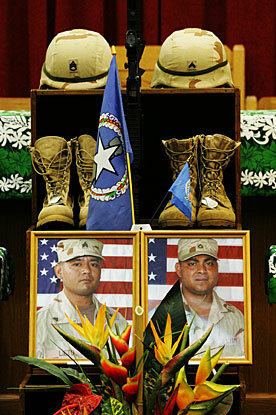 A memorial service was held yesterday at Aliamanu Army Chapel in Red Hill Army housing for two 100th Battalion soldiers killed in Iraq. Staff Sgt. Wilgene T. Lieto, left photograph, 28, and Spc. Derence W. Jack, 31, both of Saipan, Marianas Islands, died in Balad on Oct. 31 when an improvised explosive device detonated near their Humvee while they were on a patrol. 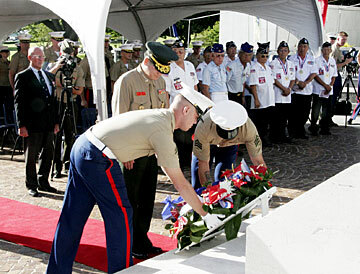 Korean War veterans bowed their heads yesterday during ceremonies in which Lt. Gen. Kim Myung-Kyun, below, commandant of the Republic of Korea Marine Corps, placed a wreath in honor of that war's veterans at the National Cemetery of the Pacific at Punchbowl. 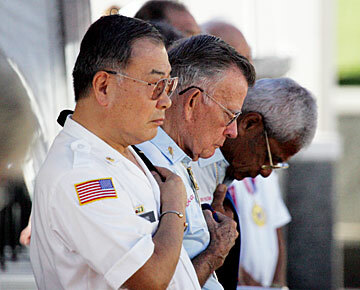 Nao Shimura, a tour group photographer, had no trouble getting his group at Magic Island to smile and wave yesterday.